The railroad lines and highways that once ferried prosperity into Lynchburg and carried goods from its factories to the rest of the nation served as conduits for drifters while economic conditions worsened during the Great Depression. The needs of thousands of transients put pressure on both the city and local charitable organizations as they struggled to care for the Hill City’s permanent residents. In 1933, the New Deal came to the rescue and launched a successful program that Lynchburg and the transients found mutually beneficial. 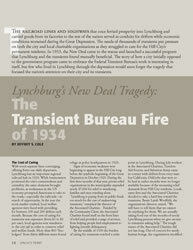 The story of how a city initially opposed to the government program came to embrace the Federal Transient Bureau’s work is interesting in itself, but few who lived in Lynchburg through the depression would soon forget the tragedy that focused the nation’s attention on their city and its transients. With seven separate lines converging, offering forty-one daily departures, Lynchburg was an important regional railroad hub in 1929. While businessmen promoted the city’s connectedness and centrality, the same elements brought problems, as weaknesses in the US economy prompted Americans to take to the roads—especially the railroads—in search of opportunity. In the year the stock market crashed, local welfare agencies were faced with providing for between 100 and 200 drifters each month. Because the cost of caring for transients was expensive (from $1 to $3 per case), local agencies sent wanderers to the city jail in order to conserve relief and welfare funds. More than 800 “free-lodgers” from thirty different states found refuge at police headquarters in 1929. Signs of economic weakness were beginning to appear in the Hill City long before the symbolic beginning of the Great Depression in October 1929. During the first three months of that year, private relief organizations in the municipality expended nearly $7,000 for relief to wandering families and men traveling alone. “Lynchburg is paying from its public funds too much for the care of undeserving transients,” remarked the director of the Associated Charities. Funded by the Community Chest, the Associated Charities found itself on the front lines of relief and provided a range of services, from helping people find employment to fighting juvenile delinquency. By early 1931, the transient problem had become the “bane of existence” for local relief organizations. The “average” Lynchburg transient was a white male out of work because of the depression. Most requested food and police-department lodging. Car transients, usually families, were also becoming a burden, although they were the objects of great concern. Charitable organizations treated them more kindly than single wanderers, providing five gallons of fuel, oil, and food for their journey. Jeffrey S. Cole is a former Lynchburg resident and graduate of Lynchburg College. He earned his Ph.D. from Bowling Green State University (Ohio) and focused his dissertation on the Great Depression and New Deal in the urban South, employing Lynchburg as a case study. A member of the history faculty at Geneva College in Beaver Falls, Pennsylvania, Cole is currently writing a book about the Federal Transient Program. His last contribution to Lynch’s Ferry, “‘The Hope of the World’: Christian Education, Dollars, and Desegregation at Lynchburg College,” appeared in the Fall/Winter 1994/1995 edition. Cole an be contacted at jscole@geneva.edu.